Millard County (/ˈmɪlərd/ MIL-ərd) is a county in the U.S. state of Utah. As of the 2010 United States Census, the population was 12,503. Its county seat is Fillmore, and the largest city is Delta. The Utah Territory legislature created the county on October 4, 1851, with territory not previously covered by county creations, and including some area in the future state of Nevada. It was named for thirteenth US President Millard Fillmore, who was in office at the time. Fillmore was designated as the county seat. The county boundaries were altered in 1852, in 1854, in 1861, and in January 1862. In July 1862, the US government created the Nevada Territory, which effectively de-annexed the described portion of Millard County falling in that Territorial Proclamation. The county boundary was further altered in 1866, in 1888, and in 1919. In 1921 a boundary adjustment with Sevier brought Millard to its present configuration. Fillmore, located near the geographic center of the territory, was originally built as the capital of Utah Territory. The Utah Territorial Legislature approved a plan to locate the capital in the Pahvant Valley. On October 28, 1851, Utah Governor Brigham Young traveled to the valley and chose the specific site for Fillmore. The town was surveyed that same day. A colonizing company soon followed; they built houses, a grist mill, and a sawmill. Construction of the State Capitol was initiated in 1852. The Territorial legislature met in Fillmore for the first (and only time) in 1855. The following year they voted to keep the capitol in Great Salt Lake City. 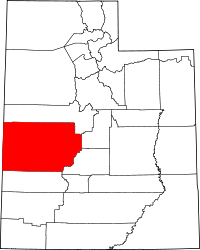 Millard County lies on the west side of Utah. Its west border abuts the east border of the state of Nevada. The county terrain consists of arid, rough andulating flatlands interrupted by numerous hills and mountain ridges. The highest point in the county is Mine Camp Peak in the Central Utah Plateaus, at 10,222' (3116m) ASL. The county has a total area of 6,828 square miles (17,680 km2), of which 6,572 square miles (17,020 km2) is land and 255 square miles (660 km2) (3.7%) is water. It is the third-largest county in Utah by area. Pahvant Valley in Millard County has several ancient lava flows and extinct volcanoes, including the "Black Rock" lava flow. About 17 miles (27km) southwest of Delta, near Black Rock's northwest perimeter is a feature named the "Great Stone Face", which protrudes about four stories above the general elevation. Locals claim that this rock formation, when viewed at the correct angle, appears similar to a profile of Joseph Smith. At ground level, within view of the "Great Stone Face", is a large, smooth-faced rock covered in Native American petroglyphs. Little Sahara Recreation Area, 25 miles (40km) north of Delta, is a popular area for ATV riders. By 2005, 86.7% of Millard County's population was non-Hispanic whites. The proportion of African Americans had doubled to 0.2%. Native Americans were now 1.5% of the county's population. Asians had fallen to only 0.4% of the population. 11.0% of the population was Latino, just above the 10.9% for Utah as a whole. As of 2010 Millard County had a population of 12,310. The ethnic and racial makeup of the population was 84.7% non-Hispanic white, 0.1% black, 1.0% Native American, 0.6% Asian, 0.1% Pacific Islander, 1.5% reporting two or more races and 12.8% Hispanic or Latino. Millard County is working hard to make it easier to build Earthships, straw bale homes, and other ecological and sustainable housing. This page was last edited on 4 April 2019, at 23:09 (UTC).